This entry was posted on Sunday, June 27th, 2010 at 4:38 pm and is filed under plants, trees. You can follow any responses to this entry through the RSS 2.0 feed. You can leave a response, or trackback from your own site. I, too, am intrigued by this. Thanks! 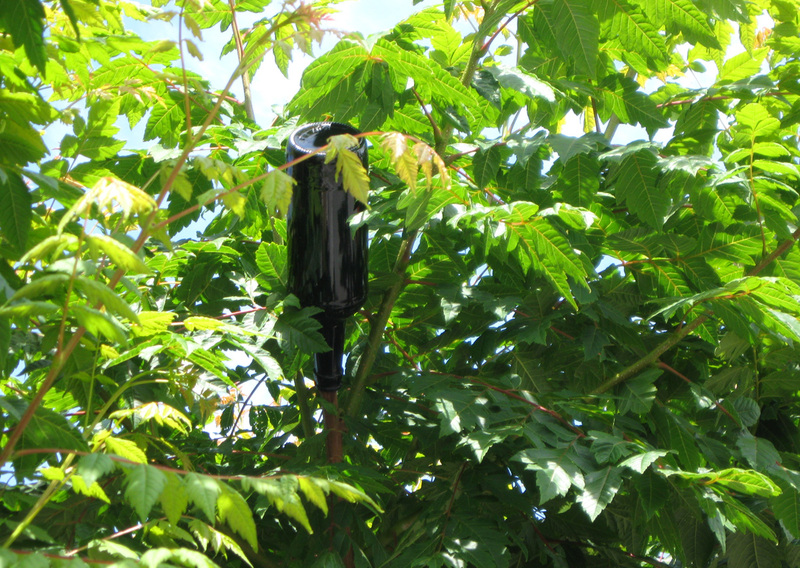 Ah, I’d been wondering about bottle trees, which keep turning up in garden blogs. That certainly explains why people would have them, though for me, it doesn’t make them any prettier…Though I do like the utility box. Now there’s a fun idea! 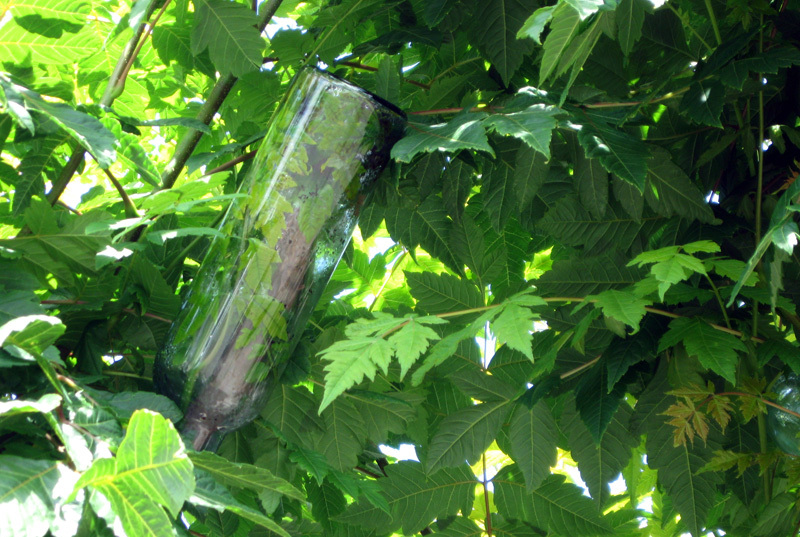 Love these bottle trees, this is the first living one ive seen, very nice! Nice to get some back story on the bottle trees. Your witch house reminds me of a sign on a garden gate I once saw: “No voodoo.” Kind of an interesting spin on the “No solicitors” sign. 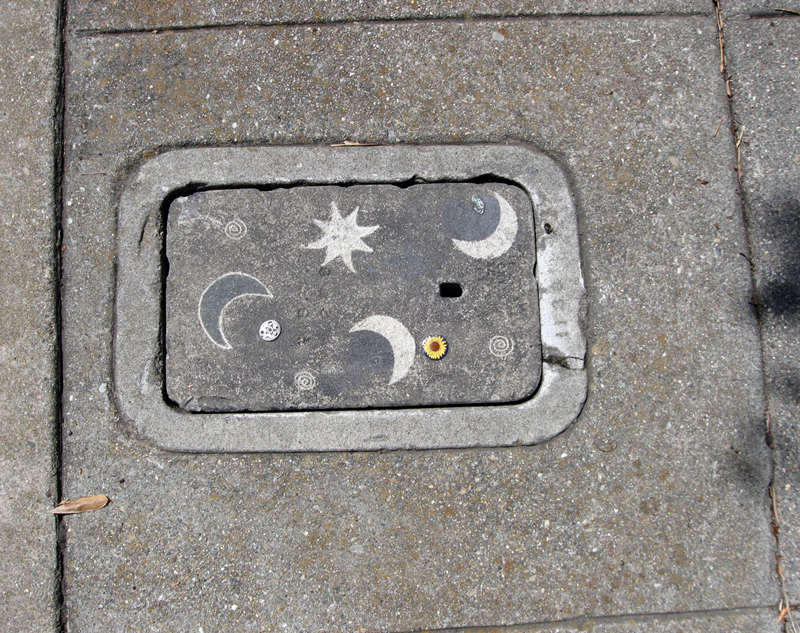 We could all use more witches in our neighborhoods if this is what they do. 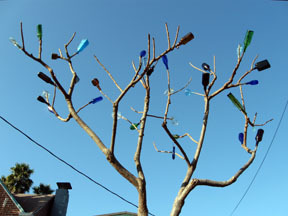 I haven’t followed the bottle tree link yet (but will). I remember a big subset of bottle tree photos in the images Edward Weston took in the early 1940s. Clearly we’re not the first Californians so taken with this cool tradition. Your link is fascinating. So the bottles should really be Haint Blue, and are a nod to the heritage of Southern slaves and the traditions of Africa. 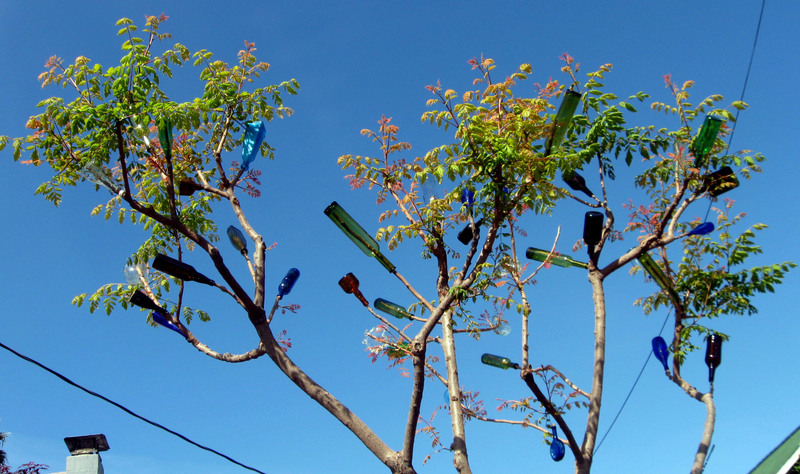 Maybe we need a bottle tree in our garden? But I couldn’t do that to a living tree. There is also a recent phenomenon of packing growing pears in a plastic form so they grow into Buddha-pears. Thanks for the comments, glad to see people were also intrigued. I like the idea of a ‘No voodoo’ sign. We could all use some witches indeed. I think I remember the Edward Weston photos. I think it’s a great link too. And, thinking about it, the symbols on the door and utility box seem to support his idea that the trees fit into the European pagan tradition. I want to check on the tree for a few years to see if it has been hurt by the bottles. I had never heard of nor seen a bottle tree before. Very interesting links. Thanks for the post. So intriguing! I didn’t know anything about this practice. “Careful, they’re witches!” Ooh, chills! Facinating! Thanks for the links too. Achoo! “Jupiter preserve you.” I’m going to use that now! Interersting! I’ve never seen a living tree done this way, and it would never have occurred to me. There’s a whole set of traditions and meanings and everything. Huh.